A decompression of the spinal canal, that carries the spinal cord, is carried out because of compression of nerves by a variety of pathological mechanisms. This can range from degenerative changes in the spine to growths, tumours and traumatic compression following an accident. The rule in general is that when the spinal cord is being compressed from the front, the operation is performed from the front of the neck (anterior) and when the compression is from structures located in the back of the vertebral column, then the procedure is carried out from the back (posterior). In cases of posterior cervical decompression, the nerves are being compressed by structures at the back of the spinal canal. The laminae (see the section Anatomy of the Spine) are the doorway to the spinal canal and they are removed in a laminectomy and partially removed and fixed partially back in a laminoplasty. 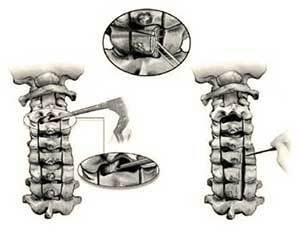 Please see the pictures on the next page for a step-by-step explanation of how a laminectomy and laminoplasty are performed. In cases where the decompression is over several levels or where the decompression is thought to cause instability, a posterior cervical fusion may be performed (see the section Posterior Cervical Fusion). At the end of the procedure, a drainage pipe will be placed in the wound and connected to a reservoir. This will allow all excess blood to drain away. Following the operation, you will be taken to the recovery room to recover from your anaesthetic. Thereafter you will be taken to the ward. You may mobilise after the operation as soon as your specialist allows this and will usually be from the day following your operation. The hospital staff will administer prescribed analgesics for any post-operative pain. These drawings demonstrate the positioning of a patient for posterior (from behind) cervical surgery. The top picture shows the patient lying on his stomach and his head fixed in a Mayfield clamp. This allows the neck to be flexed during the operation. This is important as the skin folds of the neck make it difficult to operate in the neck area. The drawing in the middle demonstrates the area of the skin incision. This will vary in length, depending on how many spinal levels are involved in the surgery. The bottom picture demonstrates what it looks like when the skin incision has been performed and the specialist has dissected through the muscles to the vertebrae of the spine. Note how the wound is being kept open with a self-retaining retractor. The spinous processes (A), laminae (B) and intervertebral joints (C) are exposed (see the section Anatomy of the Spine). These drawings demonstrate the initial steps in performing a laminoplasty. A laminectomy can be performed in a similar fashion, but is usually performed slightly differently in that the spinous processes and the laminae are removed with a combination of instruments, leaving the spinal cord completely open. 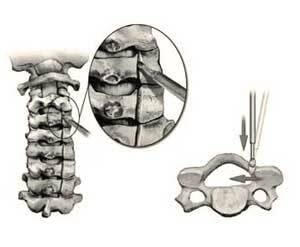 In a laminoplasty the laminae are loosened and fixed in a position to allow the underlying spinal cord freedom. The reason why the laminae and the spinous processes are retained, is because it allows the spine to remain relatively stable. One of the complications of a laminectomy is that if you remove too much of the bone, the spine may become unstable and necessitate fusion with screws and plates or rods and bone donation. In performing a laminoplasty, the laminae on the one side are separated from the vertebrae by drilling a groove all along the one side, as demonstrated above. This is called an open door laminoplasty. Sometimes the groove is made through the spinous process and the laminae is wedged open in the middle, and this is called a French door laminoplasty. These drawings demonstrate the rest of the procedure of a laminoplasty. A groove that extends through the whole of the thickness of the laminae, has been performed on the one side and on the other side the laminae has also been grooved, but not through the full thickness of the laminae. This allows the laminae to be wedged open. The ligament that lies underneath the laminae, between the laminae and the spinal cord, is called the ligamentum flavum and this is removed by an instrument called a rongeur. A probe is used to wedge the side on which the laminae has been grooved, open. The whole idea is that this will then be kept open by small plates. This is called an open door laminoplasty. Sometimes the groove is made through the spinous process and the laminae is wedged open in the middle, and this is called a French door laminoplasty. This drawing demonstrates the final stage with the laminae being wedged open and kept open by screws and plates. 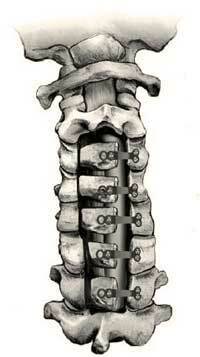 This allows the spinal cord room and also does not compromise the stability of the spinal cord. In the ward you may mobilise as prescribed by your specialist. You may be required to wear a neck collar to keep the spine stable in the direct post-operative period and you may be obliged to wear it for six weeks or more. You will usually be seen by the physiotherapist who will demonstrate the appropriate neck exercises. The drainage pipe in your neck will most probably be removed on the day after the operation. You would normally be discharged within the week following surgery with analgesics to take home. The back of your neck is often very tender and can be very painful as the operation involves the stripping of the large muscles of the neck from the vertebrae. This is typically a painful healing process and can be uncomfortable for up to several months. It is not uncommon for your neck to be stiff during this period. Wound care will be discussed with you by the hospital staff or your specialist and can be difficult in this area as there are skinfolds and a lot of stretching of the skin that can cause stress on the wound and on its healing process. It is incredibly important to get a lot of rest and exercise following your surgery. Do not try to rush back to work. It is important to walk for exercise and also exercise in conjunction with the guidelines from your physiotherapist. You may perform normal activities and wear a neck brace if your specialist prescribes it. You should refrain from exercises that involve impact for three months. This would include jogging, mountain biking and equestrian pursuits. Routinely you will receive a date for your follow-up appointment with your specialist. This may vary from anything between two and six weeks, but you will be seen earlier if there are any complications. You would usually undergo an X-ray of your neck a few months after the operation to evaluate the alignment of the spine and to see whether instability has occurred following the operation.